Team Petalcorin checked-in into the Midas Hotel & Casino Thursday, the hotel where the 26 year-old Filipino will battle Nicaraguan Felix Alvarado, 29, for the vacant IBF 108 Lbs World Title this coming Monday (Oct 29) live on ESPN 5 and ESPN+. Manny Pacquiao's MP Promotions, Jim Managquil's SANMAN Promotions and Peter Maniatis Events are the co-promoters for the IBF world class event. “Randy arrived in Manila from Gensan, and trained lightly at the Midas Hotel gym, looking very sharp. For the Alvarado fight, he has logged around 110 rounds of sparring," informed Australian Hall-of-Fame Promoter Peter Maniatis. 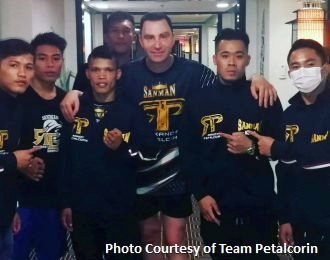 Maniatis added that "SANMAN Promotions's CEO Jim Managquil got Randy Petalcorin ready for the fight with an amazing training camp. The effort has paid divestment. Because Petalcorin looks spot on." According to Maniatis, after the Thursday evening (Oct 25) workout, Petalcorin weighed-in at an unofficial 109 pounds (49.5 kilos), with only one pound to lose before the weigh-in Sunday morning at TV5 Studio 4 in Mandaluyong, Metro Manila. “Petalcorin can make the weight of 108 pounds now, if needed! His weight is under control. "I remember the day before Petalcorin fought Omar Kimweri in Australia. Petalcorin had to shed ten pounds in a hurry the day before the weigh-in. But Not this time. This time Randy is right on target,” assured Maniatis, a good friend of the late dear Filipino broadcaster Ronnie Nathanielsz. "Alvarado says that his fight against Randy won't go past seven rounds because he does not want to leave the decision to the judges. "Well, I don't think that Alvarado has done any homework on searching how great Randy Petalcorin fights. "So lets see Monday night if Alvarado can get the job done," concluded Peter Maniatis, Petalcorin's long term promoter." The author Carlos Costa is a veteran Panama-born man of boxing living permanent in the Philippines. Carlos can be reached by email: Carlos512@hotmail.com and Whatsapp: +639184538152.